Elevation profile created by Zdenek on his 2014 GDT hike Thank you for allowing me to share these Zdenek! Note that I did a high route along that flat upper section that isn’t on this chart. I’m pretty wiped out with my energy level being low this time of the month and I think the culmination of such a long hiking season for me. A lot happened today, and I want to get it all in, so excuse any rushed mistakes. 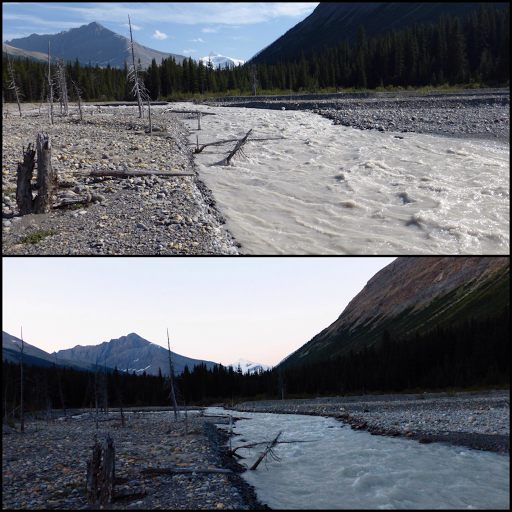 We awoke to find that the Smokey River had gone down significantly! It was totally fordable. Here’s a side by side of how it looked last night and then this morning when we forded. Whew, glad those glaciers freeze up at night! It was COLD and stung pretty bad when we crossed and for a bit afterward. 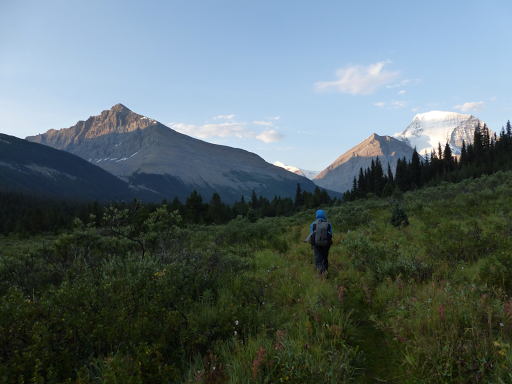 After that, we were officially off the GDT and headed to Mt Robson Visitors Center on a 17mi/27km side hike along the very popular Berg Lake Trail to resupply. No, you didn’t read that wrong. 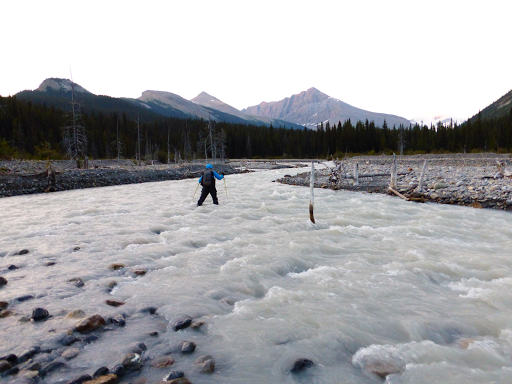 It is a day’s hike off trail each way to resupply here and then it is 9 days further to the finish at Kakwa Lake. 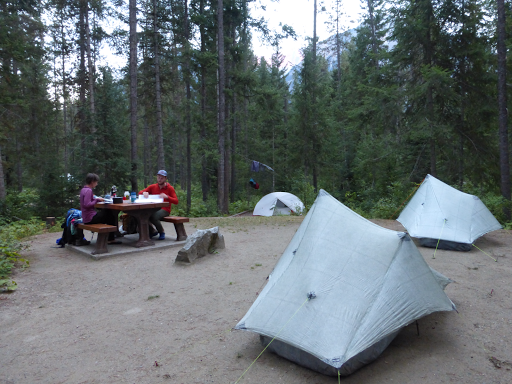 That is why so many GDTers finish their hike at this busy visitors center and campground than in the middle of nowhere at Kakwa Lake. 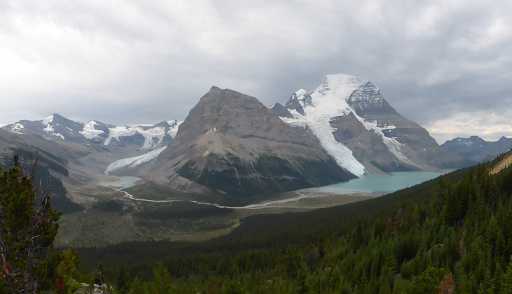 We had a level valley hike to reach the BC/Alberta border, entrance to Mt Robson Provincial Park, and the beginning of the Berg Lake Trail to Mt Robson. 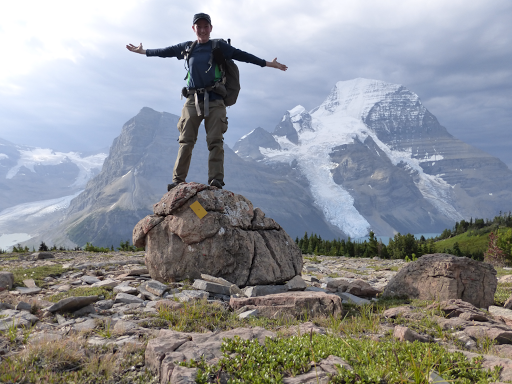 On the right in the photo is Mt Robson, the highest peak in the Canadian Rockies at 12,972ft/3,954m. It is a nice downhill hike to the visitors center passing many sights and campgrounds that book well in advance. There is an option up top to take a parallel high route trail called the Mumm Basin Route. I decided to take it since I had a light pack and would see the low route when we hike back out tomorrow. E chose to stay on the low route and we agreed to meet at the end of the day. The high route is 2mi/3km longer and has quite a bit of elevation gain. 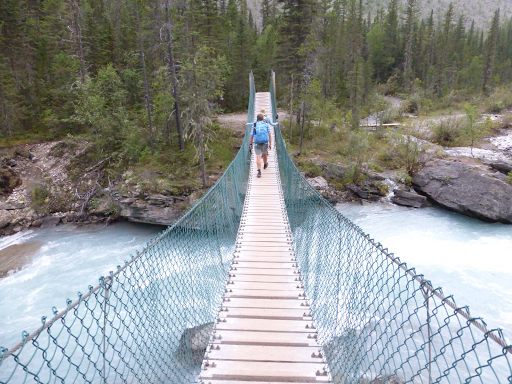 I wouldn’t say it’s a must do for GDTers, and if you do choose to do it, I’d rather recommend just doing the first half of it and going down the Toboggan Falls trail halfway through to reconnect to the Berg Lake Trail earlier. The second half of it is mostly wooded and the extra bit to see Hargreaves Lake wasn’t great. The lake itself wasn’t what I hoped for. Kinda tan in color and seemed to be quite low, so maybe I just got a low year. Doing just the first half is what I recommend and that has you missing just about 2km/1.5mi of the Berg Lake Trail along Berg Lake. I’ll find out tomorrow what I missed when I hike back up and compare the two. The part that was out of the trees was cool and it was nice to see everything from above. It’s more effort, but the high route is more of what I’m out here to experience. Here are some shots. Loved having it all to myself in this high traffic area! It was pretty hazy and cloudy while I was up there. 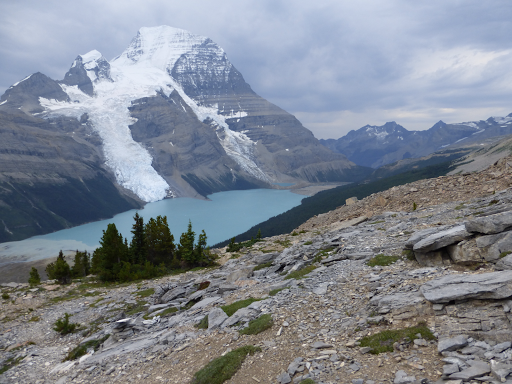 After I finished the Mumm Basin Route and dropped down to the Berg Lake Trail and got a closer view of Berg Glacier, which I’ll get better views of tomorrow. I was on it for about 10mins when I heard an odd sound kinda like howling in the distance. I heard it again and looked around. It was Gian and Laura behind me! They had camped a campsite behind us last night and today was their final day on the GDT, yay! As I mentioned before, this is where many GDTers choose to end their hike. It was great to hike down with those two on their final day. We moved pretty quick in all the chatting and excitement to get down. There are a few side sights along the way. 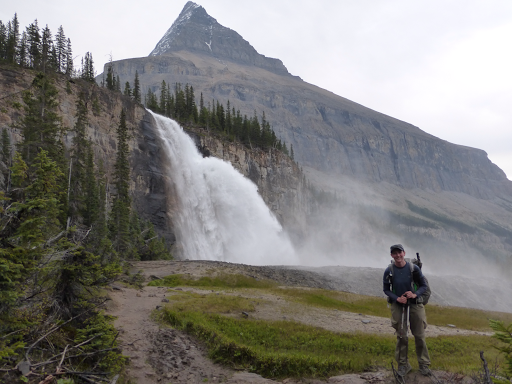 We did a short side trail to see Emperor Falls and that was a powerful falls. 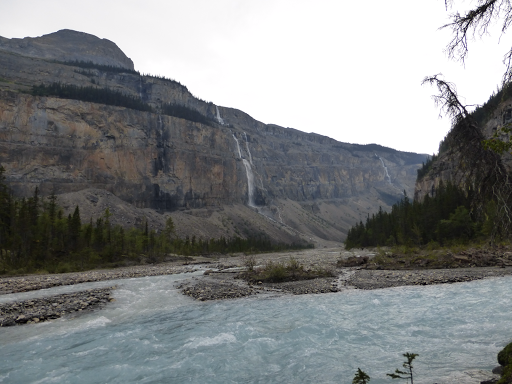 From there, the trail drops more steeply for a few miles to The Valley of a Thousand Falls. I don’t know if that’s really how many it has, but all along the cliff walls in the distance are waterfalls coming down. Some, you wouldn’t even notice if you weren’t looking for them. Through this area are some small narrow bridges that one person at a time is asked to cross. 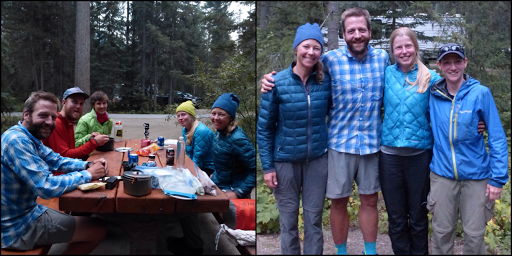 On one of them, we were waiting for some people to come across and it was someone familiar…it was Geoff and Lynn who we had met one morning at a remote campsite (Avalanche) a week ago on Day 32. What a great coincidence. Geoff is the one that works at the same university (Univ of Illinois) where I went to college in central Illinois. It was great to see them again and to have such a connection out on these trails. They should be at the same campsite we’ll be at tomorrow night, so we might see them again. 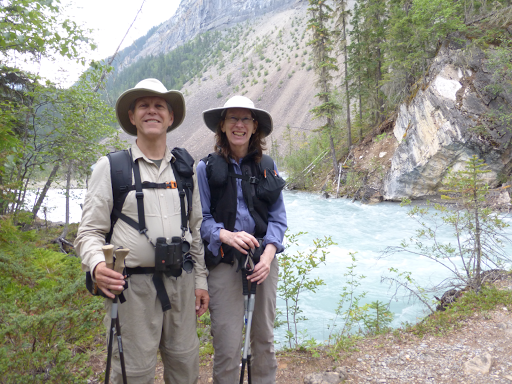 We finally arrived at the Berg Lake Trailhead and took finish photos of Gian and Laura. It’s just great that we met them on their first day, and I took their photo, and now 40 days later, here we are. It took some coaxing, but I got a jumping finish photo out of them that is a classic! Congrats to Gian and Laura!! There is still a 2mi/3km walk on a gravel road to the visitors center and cafe. Luckily, we got a hitch down fairly quickly. Great not to walk that final stretch! They dropped us off at the cafe next to the the visitors center at 3:30pm. 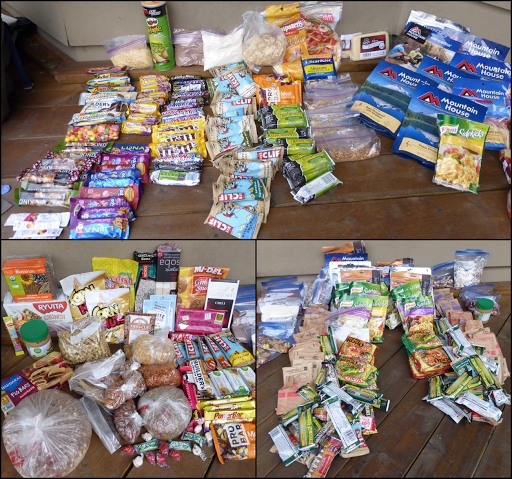 There is also a small convenient store with minimal food options and not enough to resupply, so we all had sent boxes to the visitors center. E was there and hadn’t been there very long, so it was great timing as we all are together. Then we headed to the visitors center for our resupplies and wifi. They are great there and there was a large deck with a view of Robson for us thrus to hang out without being too intrusive. There a few spots to charge things if you look around and there is wifi, but it’s slow going and I could only get one blog posted. 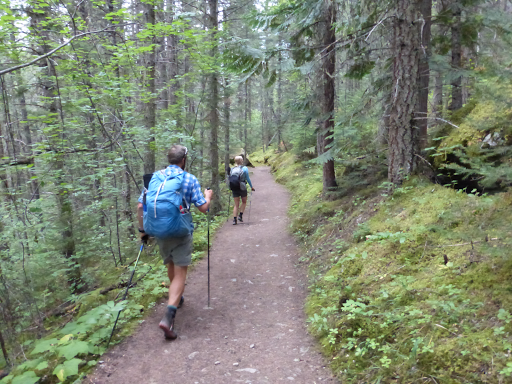 While we were there, two sobo GDT hikers arrived. More GDTers! Zoe and Aaron had an interesting start. 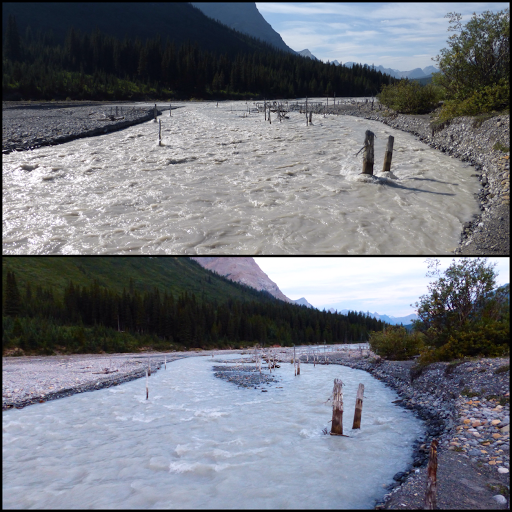 They had some transportation glitches that had them starting in Jasper and coming around along the North Boundary and others for two weeks to then hit the GDT here. They are doing a totally unwired hike with not even a watch. They don’t carry the guidebook (but have it at home) and are using general overview maps to kinda figure it out after reading some of the guidebook beforehand. Their goal is more of the remote experience and just seeing how far they can make it until the winter weather returns. Good for them for making it their own hike! We did our resupplies on the deck and had fun doing some trading. 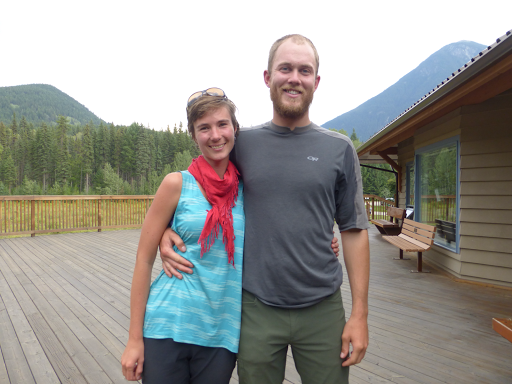 Gian and Laura weren’t sure if they’d be going up to Kakwa and sent food, so they had some boxes too. 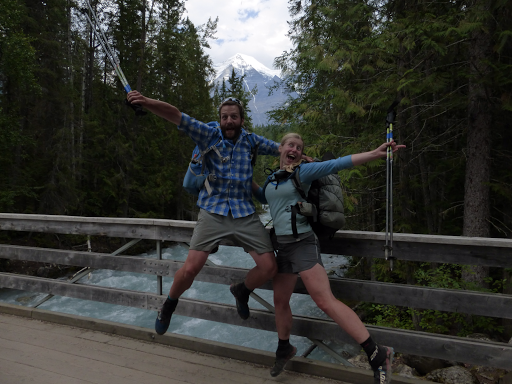 They are going to explore a bit around Jasper and will soon fly to Alaska to adventure for awhile and even have an inflatable pack raft Here are some comparisons of what we a It’s crazy to see the difference in both type and quantity. That’s 9 days of food. Mine on top, E on the left, G&L on the right. Finally, we all camped across the street at the Meadows Campground. It was $28CAN/site and we were able to spilt a site with Zoe and Aaron. Really spacious campground that didn’t feel like people were on top of us. Plus, it had complimentary free warm showers! I decided to wait until the morning so I wouldn’t have cold wet hair overnight. Oddly, it’s a drive in campground, so when the trail host came by to get our names and license plate numbers, she didn’t know what to do with us. We were right across from Gian and Laura who had gotten beer from other campers (and got me a chocolate milk!) to celebrate their finish. This may be one of the largest crossings ever of GDTers in one resupply spot…the afternoon went by fast and I am spent and an going to sleep well tonight. Sleeping in tomorrow!